The vision behind the Wisdome project is to reach millions of school children and students through immersive science communication all over Sweden. The Irish author George Bernard Shaw once wrote: “We are made wise not by the recollection of our past, but by the responsibility for our future”. This sentiment is captured perfectly in project WISDOME (short for Wallenberg Immersive Science Communication Dome). The vision behind this project is grand; to reach millions of school children and students through immersive science communication all over Sweden. How? By upgrading the current dome theater at the Visualization Center C in Norrköping and establishing four new domes at science centers in Malmö, Gothenburg, Stockholm and Umeå. The Knut and Alice Wallenberg Foundation is the largest private financier of scientific research in Sweden. In 2017, the Foundation celebrated its 100th year with an anniversary grant, of which 150 million SEK was awarded the WISDOME project, spread out among the project partners. The Visualization Center C in Norrköping takes lead in the project, owing to the world leading visualization research done here, as well as the already established dome at the center. 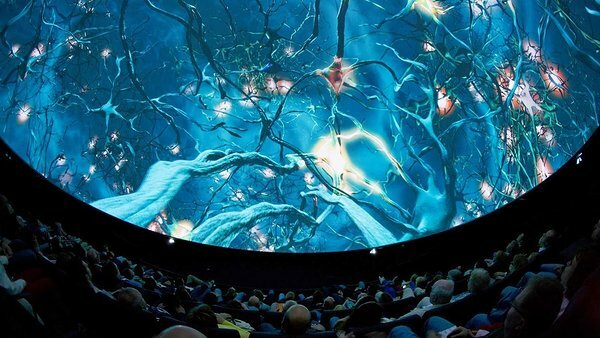 It is currently the most high-tech dome theater in northern Europe with a near 5k resolution, 3D enabled, 360 degree dome that can bring up to 99 viewers on scientific journeys through space and time. The dome is set to be upgraded to an 8k resolution during 2018 which will make for even stronger immersion and a better visitor experience. It will stand as a model for the domes that are to be built at Malmö Museer, Universeum in Gothenburg, Tekniska Museet in Stockholm and Umevatoriet in Umeå. Technological details aside, within the framework of the project there is a long term goal to produce five new fulldome documentaries, spanning a wide range of scientific topics, at the Visualization Center C in Norrköping. These are not just 3D movies, but real-time, interactive fulldome shows. Even today, we collaborate with agencies such as NASA to showcase cutting edge research from our solar system by “landing” in real-time on Mars (using actual footage in 3D), doing fly-bys over Pluto and visiting most any other places in the known Universe one could wish for. Once the new domes are built, a network will be put in place to stream events between the domes. The Visualization Center C will also deliver top-tier content to all five domes as well as distributing it worldwide. The possibility to go on collective journeys in 3D is a revolution within science communication. Together with a guide and a pilot, school classes and other groups can, as mentioned above, travel to Mars or to the ends of space as we know it. They can travel into our bodies and look inside the cells, to witness a universe of another kind where organelles, DNA, mitochondria and other wonders await. The pilot can control the view in real-time, making the experience more immersive, while the guide can tell the viewers what they see and even start a dialogue about what is currently experienced. Through these immersive experiences we can make coming generations excited about science in an unparalleled way. Truly, taking responsibility for our future. For more info about the project, visit https://wisdomeproject.se, or come visit us at the Visualization Center C in Norrköping!